Let’s celebrate Women’s Fiction Writers 4-year blogiversary with a giveaway, shall we? 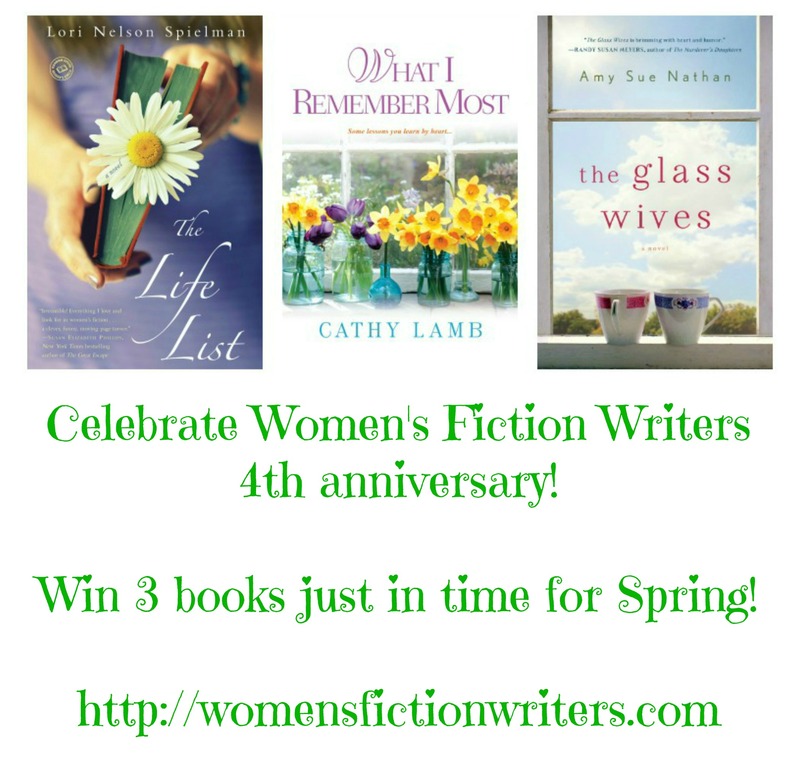 One winner will receive THE LIFE LIST by Lori Nelson Spielman, WHAT I REMEMBER MOST by Cathy Lamb, and THE GLASS WIVES by Amy Sue Nathan (that would be moi)! Check out the Rafflecopter link below to enter! Thank you for being part of Women’s Fiction Writers! Click here to enter: a Rafflecopter giveaway for Women’s Fiction Writers! Looks like a fantastic giveaway. Who needs basketball when you can have books like this to read! THE GLASS WIVES and THE LIFE LIST were both fantastic books. I haven’t read WHAT I REMEMBER MOST yet; I’ll have to check it out. Thanks for all the wonderful good reads tips you’ve given me. I haven’t read WHAT I REMEMBER MOST, either–but the other two novels ROCK. Great giveaway, Amy! Count me in! The Life List is my all time favorite book! I’d love to read The Glass Wives and What I Remember Most! So excited to have found some great new authors and amazing books to check out! Thanks for the chance to win great books! I haven’t read what I Remember Most either. Definitely LOVED the other two. Thanks for the great giveaway! Congratulations on four years, Amy! Happy Blogoversary! I enjoy women’s fiction and so I like this site. I have the Cathy Lamb book but making a note of the other two. I live internationally so I presume giveaway is just USA.